with the love of The Two Hearts." The time has come for me to retire, but not FIAT VOLUNTAS TUA. This is Our Lady's organization and she still needs your help. 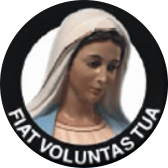 Our Lady called you to Medjugorje and you responded to her call through FIAT VOLUNTAS TUA. Please continue to do so. She asked you to become her apostles when you returned home which many of you have done. Thank you for responding to her call. It is my great pleasure to introduce you to Grace Legaspi who will continue to help Our Lady run the Fiat nonprofit organization. She will continue to work with Mirjana, the visionary, and will have accommodations at Mirjana's home when possible. As you know being at Mirjana's is a gift from Our Lady. Miki Musa who is very spiritual, honest and holy, works very hard for the pilgrims and will continue as Fiat's guide. This combination can't be compared to. I will pray for each of you every day for the rest of my life. I thank God and Blessed Mother for the opportunity to experience Medjugorje, Mirjana, Miki. and all of you. This has filled my heart with peace, love and joy. May God bless you and fill your hearts with the love of The Two Hearts.